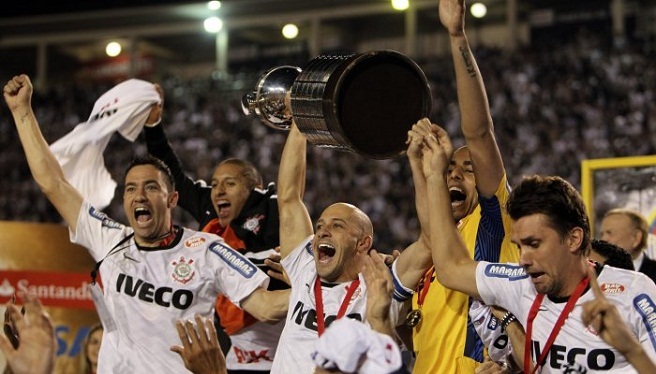 Corinthians won their maiden Copa Libertadores title in 2012. Who will win the trophy in 2013? The Copa Libertadores kicks off on Tuesday with twelve teams fighting it out for the six remaining places in the group stages which begin on February 12th. The biggest team in the first stage of the competition are Brazilian giants São Paulo, a former three-time winner of this competition, who qualified for the Libertadores on the back of a controversial triumph in South America’s second tournament, Copa Sudamericana, at the tail end of 2012. São Paulo, leading 2-0 in the second leg of the final Argentinian side Tigre, were accused of intimidation during the half-time interval by their opponents who refused to come out for the second half. São Paulo were, therefore, awarded their first Sudamericana and also rewarded with a place in the more celebrated Libertadores and will face off against Bolívar in the first stage. Tigre, fortunately for them, qualified for the Libertadores on the back of being the best performing team from Argentina in the Sudamericana who hadn’t already qualified for the Libertadores via domestic competition. They will be big favourites to reach the group stages when they get their campaign started against Venezuelans Deportivo Anzoátegui. Two former winners of the competition will meet with Brazilians Grêmio, winners in 1983 and 1995, paired with LDU Quito. The Ecuadorians were a dominant force in South American football in 2008 and 2009 when winning both the Libertadores and Sudamericana in those respective years but have only claimed one national title in the three years since then and qualified for this competition on the back of their 3rd place finish in Ecuador last year. Olimpia of Paraguay is another former three-time Libertadores champion having to start this year’s campaign early and will be involved in a tough two-legged encounter with Uruguayans Defensor Sporting. The remaining two fixtures involve clubs who have yet to win an international club title with Peru’s Universidad Cesar Vallejo making their debut in this tournament against Colombia’s Deportes Tolima whilst Chile’s Deportes Iquique will meet Mexicans CSD León. Whoever makes it through the first stage of the competition will then look forward to mixing with the elite of South American football. Defending Libertadores champions Corinthians, who defeated Boca Juniors 3-1 in last year’s final to claim their maiden title, have an easy looking group on paper and should make it past Bolivians San José, Colombians Millionarios and Mexicans Club Tijuana. Last year’s losing finalists Boca Juniors feature in an interesting looking group which also involves Uruguayan giants Nacional, Ecuador’s FC Barcelona de Guayaquil and Mexicans Deportivo Toluca. All of the other six groups will be known upon the completion of the first stage. No sooner have Brazil’s vast array of localized state championships reached their conclusion does the time come for the national championship to commence. The “Brasileiro” is now in its 41st year and the quality of the competition has increased in recent years thanks to the adoption of a standard round robin league format, as used in many of Europe’s top leagues, which has brought about many a dramatic finish since it was introduced in 2003. Corinthians are the defending Brazilian champions having pipped Vasco da Gama to the 2011 season title with just two points separating the top two as the Timão sealed their fifth national crown in dramatic fashion. Corinthians were involved in a big derby clash against São Paulo city rivals Palmeiras whilst Vasco were due to face off against their eternal rivals Flamengo CF in Rio de Janeiro on the last day of the campaign. Corinthians could only muster a goalless draw at home to Palmeiras but, with the visitors thinking that they had done enough to deprive their arch-rivals of the title, news came through that Vasco had blown their big chance, dropping two points with a 1-1 draw. The allocation of places for the South American club tournaments has certainly played its part in helping to create a more interesting domestic championship. At the end of the season only four clubs will finish in a league position (i.e. from 13th to 16th) with virtually no meaning other than league safety. The top four, along with the winners of the domestic knockout competition “Copa Brasil”, qualify for South America’s premier continental competition Copa Libertadores whilst the next eight teams qualify for the secondary tournament Copa Sudamericana. The bottom four, meanwhile, go straight down into Serie B with famous clubs such as Grêmio, Corinthians and Vasco da Gama having seen the drop at some point over the last decade which is an indication as to how competitive this league has become. Four clubs – Corinthians, Santos FC, Vasco da Gama and Fluminense – may lose some of their focus in the first few weeks of the season as they play out the latter stages of this year’s Copa Libertadores competition, which is currently at the quarter-final round, but should feature prominently as the Brasileiro season progresses. Out of that quartet, Santos and Fluminense have had state championship success to celebrate over the past seven days; the former defeated Guarani in the Paulista final to win their 20th São Paulo title whilst the latter got the better of Botafogo to claim their 31st Carioca state crown. Amongst the other state title winners in the Brasileiro include Internacional of Porto Alegre (Campeonato Gaúcho), Coritiba (Paranaense), Atlético Mineiro (Mineiro) and EC Bahia (Baiano) with those clubs have varying degrees of potential for success in this year’s national championship. Famous clubs such as São Paulo FC and Cruzeiro will have their eyes on one of the South American spots with the former hoping to win their first title since the famous “Tri-Campeão” season of 2008 in which they won the Brasileiro for the third successive year, the first time a club had accomplished that feat in the modern era. This season’s Brasileiro begins this weekend and is due to finish in early December. In the first round of matches Corinthians will begin their title defence with a home tie against Fluminense, Vasco da Gama welcome Porto Alegre giants Grêmio whilst Santos FC, champions in 2010, must travel to face EC Bahia. Other stand out fixtures on the opening weekend sees São Paulo FC play host to losing Carioca state finalists Botafogo, three-time champions Internacional face off against Coritiba and 2003 champions Cruzeiro play against Atlético Goianiense. The four teams that were promoted from Serie B last season will also begin their campaigns. Portuguesa, promoted as Serie B champions, begin with a difficult away tie against Palmeiras whilst Club Náutico also find themselves on the road with an away day at Figueirense. Ponte Preta and Sport Recife, on the other hand, will begin the new season with home fixtures, the former against Atlético Mineiro and the latter face up to the challenge of Flamengo CF. Universidad de Chile are the deserved winners of the 2011 Copa Sudamericana. Their 3-0 second leg victory at home to LDU Quito last night completed a 4-0 aggregate win and brought with it the chance to compete in next year’s Copa Libertadores. Eduardo Vargas, as so often in this competition, proved himself to be the hero for the Chileans. Vargas, who scored the only goal of the first leg last week in Ecuador, struck in only the third minute of the match to double Universidad’s advantage on aggregate. Second half strikes by Gustavo Lorenzetti and Vargas sealed the deal for La U who, as a result of their unbeaten run in this competition, won their first ever continental title. Universidad de Chile have the chance to increase their trophy tally next year when facing off against 2011 Copa Libertadores winners Santos in the Recopa (South American Super Cup) and in the Suruga Bank championship which sees the Chilean champions face off against Japanese J-League Cup winners Kashima Antlers. It’s first blood to Universidad de Chile in the 2011 Copa Sudamericana final following their 1-0 first leg victory over Ecuadorians LDU Quito last night. Eduardo Vargas’s goal in the 43rd minute of the game proved the difference as the Chilean champions take a slender one goal into next Wednesday’s second leg in Santiago. For Universidad their unbeaten run in this year’s competition continues, having not lost a game in any of the eleven matches they’ve faced so far. If they maintain that record in the second leg then they will win the first continental title in their history. The Brazilian national championship has made a habit of last day climaxes in recent years and this season’s competition is no exception. Corinthians (Played 38, Points 71) won their fifth Brasileiro tonight, their first league title since 2005, following a goalless draw against arch rivals Palmeiras. This came at the expense of Vasco da Gama who, needing all three points in the event of a slip up by Corinthians, were only able to draw 1-1 at home to Flamengo in another high profile derby match. On a day in which Brazilian football legend Socrates passed away, it was perhaps a fitting tribute to him that one of his old clubs should go on to win the title. Socrates served the São Paulo based club with distinction from 1978-84 in what was his most productive spell with any one club. It was derby day in Brazil as the national federation had decided that the final round of matches should produce some thrilling drama on the last day and they weren’t disappointed. Although Corinthians’ match with Palmeiras remained goalless both teams were reduced to nine men as each side battled to get one over the other in a derby where there is no love lost and in which emotions certainly ran high with confrontations amongst the players commonplace throughout the game. Palmeiras thought they had ruined Corinthians’ title party by getting the draw but news came through of Vasco’s draw with Flamengo which prevented the former from overtaking Corinthians in the standings, the margin between the top two teams remaining at two points. Just to add a little spice to that encounter there were two red cards in that game as well, one for each side. But it wasn’t just at the very top of the table where things were interesting. With places in next season’s Copa Libertadores and Copa Sudamericana to be sorted and relegation matters to be resolved at the bottom there were very few teams playing tonight for whom nothing mattered. Fluminense and Flamengo got the point they needed to secure Copa Libertadores placings for next season along with Internacional who, in the Porto Alegre derby, got the better of arch foes Grêmio by a 1-0 score line. Santos FC (2011 Copa Libertadores champions) and Vasco da Gama (2011 Copa Brasil winners) were already assured of their Libertadores places for next season before tonight’s games took place. Copa Sudamericana places went to eight clubs – São Paulo, Figueirense, Coritiba, Botafogo, Palmeiras, Grêmio, Atletico Goianiense and EC Bahia – whilst four clubs were unfortunate to experience that sinking feeling as Avaí, América Mineiro, Ceará SC and Atlético Paranaense were relegated into Serie B next season. Cruzeiro of Belo Horizonte and Atlético Mineiro were lucky to stay in the top flight as they finished just two and four points above the relegation zone respectively. Universidad de Chile made club history last night by reaching their first ever continental final in South America. The Chilean champions defeated Brazilian giants Vasco da Gama in last night’s Copa Sudamericana semi-final 2nd leg by two goals to nil and, thus, went through 3-1 on aggregate. Gustavo Canales and Eduardo Vargas were on hand to score the goals for Universidad who became the first Chilean team to reach a major final of a South American club competition since Colo Colo played in the final of the Sudamericana in 2006. Vasco da Gama didn’t really threaten the Chileans on their home turf but they more than likely had one eye on the oncoming climax to the Brasileiro league season which concludes this Sunday with the Rio de Janeiro giants hoping to beat arch rivals Flamengo, and hope that league leaders Corinthians lose to Palmeiras, to win the Brazilian title for the first time in ten years. For Universidad exciting times lay ahead. Not only do they participate in their domestic Clausura play-offs in the hope of winning back-to-back Chilean League titles, but their Copa Sudamericana final with Ecuadorians LDU Quito will take place on December 7th and 13th with the Chileans at home for the second leg. LDU Quito have given themselves a great chance of reaching this year’s final by defeating Argentinian giants Vélez Sársfield in the semi final, first leg. Following a goalless first half, LDU Quito had Hernan Barcos to thank for scoring the goals which have allowed the Ecuadorians to put one foot in this year’s final. LDU have made a habit out of winning major titles in South America in recent years having won the 2008 Copa Libertadores, 2009 Copa Sudamericana as well as winning back-to-back Recopa (South American Super Cup) titles in 2009-10. Velez, though, will have home advantage in the second leg, which takes place this coming Tuesday evening, and will hope to win their first major continental silverware since winning the 1997 Recopa. The first leg of the 2011 Copa Sudamericana semi-final between Brazilian giants Vasco da Gama and their opponents Universidad de Chile was played in the former’s São Januário stadium on Wednesday night. The Brazilians took the lead after half an hour through Bernardo and the goal looked like it might decide the outcome of the first match. However the Chileans managed to draw level with twelve minutes left through Osvaldo González and ensure that Universidad’s chances of winning a first continental title remain strong. The other semi-final first leg between Argentinians Vélez Sársfield and 2009 Sudamericana champions LDU Quito will take place on Thursday night at the latter’s home ground in the Ecuadorian capital. 2009 Copa Sudamericana champions LDU Quito became the first team to reach the quarter-finals of this year’s tournament on Wednesday. In last night’s Round of 16 second leg against defending champions Independiente the Ecuadorians, who were 2-0 up from the first match a fortnight earlier, lost out to a lone strike from Leonel Núñez. That, however, only reduced the arrears by half and the Argentinian side were unable to find a second goal which would’ve taken the match into a penalty shoot-out. LDU will now face off against either São Paulo (Brazil) or Club Libertad (Paraguay) fixture in the next round.